PepsiCo offers a high dividend yield, as well as strong dividend growth, which makes it one of the top dividend stocks in the market today. These are not easy times for large multinational companies like PepsiCo (NASDAQ:PEP). The first quarter was a tough one, as PepsiCo's revenue and earnings were weighed down by a brutal foreign exchange headwind. The rising dollar against international currencies such as the euro made it much harder for American companies that do a substantial amount of business overseas to meet earnings expectations. Foreign exchange issues actually caused PepsiCo and many other companies to report falling revenue last quarter. Nevertheless, PepsiCo remains one of the world's strongest brands and highest-quality businesses for income investors, and its recent dividend increase proves it. Shortly after reporting first-quarter earnings, PepsiCo raised its dividend for the 43rd consecutive year and delivered a 7% dividend increase to investors this quarter compared to same period last year. This ensures PepsiCo maintains its coveted Dividend Aristocrat status, which is reserved for truly elite businesses that have a strong history of boosting shareholder value through dividends. PEP Dividend data by YCharts. As shown in the chart above, PepsiCo has an extremely long streak of steady, annual dividend increases. 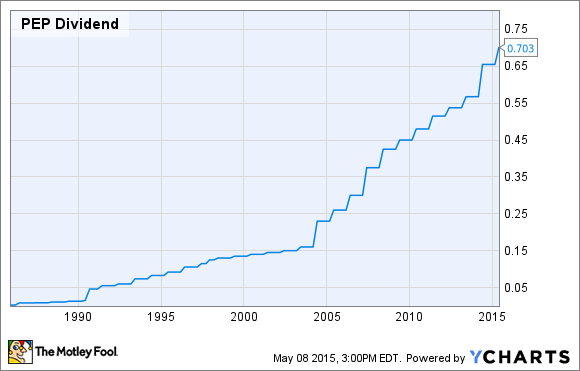 PepsiCo's new annualized dividend totals $2.81 per share, which provides a solid 2.9% yield. That's significantly above the broader market as measured by the S&P 500 Index, which averages about a 2% dividend yield. The dividend increase is part of PepsiCo's broader capital allocation program. During the past decade, PepsiCo returned more than $60 billion to shareholders in combined dividends and share repurchases. In 2015 alone, PepsiCo expects to return $8.5 billion-$9 billion to investors. The reason why PepsiCo can afford to pass along such generous amounts of cash to investors is that, even with difficult macroeconomic circumstances, the company still generates healthy cash flow. PepsiCo raked in $7.6 billion of free cash flow in 2014, up 11% from $6.8 billion the previous year. Meanwhile, PepsiCo's dividend cost $3.7 billion last year, resulting in a very comfortable 48% free cash flow payout ratio. The good news doesn't end there, either. Going forward, PepsiCo has a number of initiatives in place to ensure it should have plenty of room for its amazing dividend streak to continue. One way PepsiCo plans to keep growing free cash flow is to continue building its massive portfolio of popular brands. PepsiCo's product portfolio now has 22 brands that each collect at least $1 billion in annual sales, including its flagship Pepsi, Mountain Dew, Diet Pepsi, Doritos, and Ruffles. In the years ahead, PepsiCo has embraced the trend toward healthier food and beverages, through its brands like Naked and Sabra. These healthier products, which appeal to younger consumers, stand a great chance of adding to PepsiCo's billion-dollar brands. Another measure in place to keep cash flow growth intact is to reduce expenses. PepsiCo delivered $1 billion in cost savings just last year as part of its ongoing productivity initiative. Management anticipates cutting approximately $1 billion in costs each year from 2015-2019. This will be accomplished by PepsiCo transforming its business model. PepsiCo will utilize its scale by enabling individual country teams to make quicker decisions to serve local consumers and retailers rather than taking the old, highly decentralized approach. Not only does PepsiCo provide a market-beating dividend yield, but it also increases its dividend at high rates each year. During the past five years, PepsiCo has increased its dividend by 7%, which is well above the rate of inflation. This means that investors looking for either current income or dividend growth can count on PepsiCo. Plus, thanks to PepsiCo's massive portfolio of strong brands, as well as its cost-cutting efforts and strong free cash flow, it's very likely the company will continue to increase its dividend for years to come.